Throughout the school year, the Prep is involved in various outreach programmes. These include Civvies Day collections, market days, specific fund raisers and Grade 7 Entrepreneur Days. These are all enthusiastically embraced by boys, staff and parents alike and money, food, clothing and other items are regularly donated to various organisations. In the past we have supported the Peninsula School Feeding Scheme, the Animal Welfare, The Carthorse Association, the Chaeli Foundation and various upliftment programmes. Each term we have a civvies day. Many organizations have benefitted from such days. St Luke’s Hospice, the Suburban Clothing Guild, the Homestead, The Haven, Leliebloem House, VUSA, SPCA and Miles for Smiles are some of the past recipients. Every year we collect and donate Easter eggs to a variety of underprivileged schools and also annually we have a Pup Idols competition to raise money for the Guide Dog Association. We also celebrate Madiba Day by making newspaper and plastic sleeping bags for the homeless. One of our biggest drives so far has been quilts made from Sunflower Fund bandanas. We collect bandanas which we give to the Westlake Upliftment Project. The ladies of this Aids support group make quilts which we pay them for, and these so far have been given to Victoria Hospital, Red Cross, the Sarah Fox Home and a crèche in the Barcelona informal settlement. For a few years our school has twinned with St Paul’s Primary in the Bokaap. Pupils from St Paul’s have visited the Prep for mornings of games, singing and reading and our boys have visited their campus during various projects. We collect books and shoes for St Paul’s on an ongoing basis and each year we put together Christmas hampers for their 700 children. Toys collected at our Carol Service each December are given to St Paul’s inter alia. The retiring Collection at our annual Carol, Service is given to the Peninsula School Feeding Association. These are just some of the projects undertaken by Bishops. There are numerous others, but too many to mention here. It is gratifying to see the enthusiasm with which our boys reach out to the less fortunate in our community. 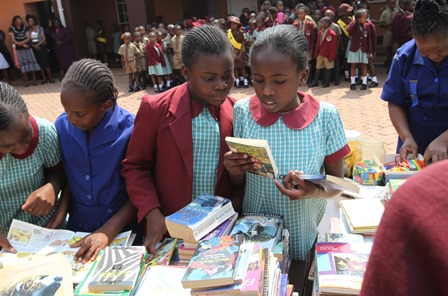 Books donated by the Prep arrived safely in Zimbabwe!